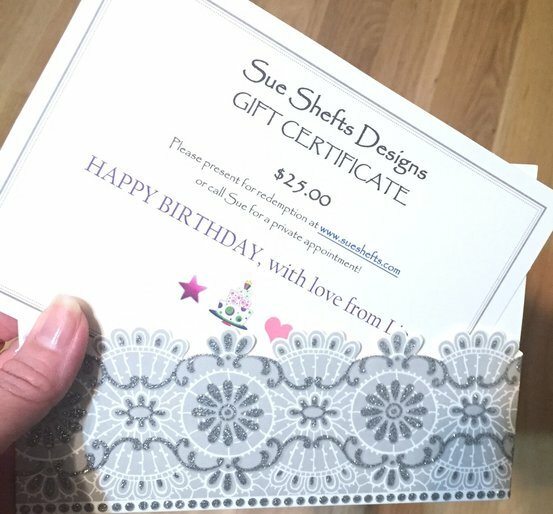 Purchasing a Sue Shefts Designs gift certificate is simple! Once purchased, you will receive a voucher code via e-mail message from Sue Shefts Designs (atlbeadgirl@bellsouth.net). Simply present this code to the recipient and direct them to this website, www.sueshefts.com. This code will expire one year from the original date of purchase. Please keep in mind that the entire value of the voucher must be redeemed in a single shopping session. When giving a larger gift, you may choose to purchase multiples in smaller denominations.